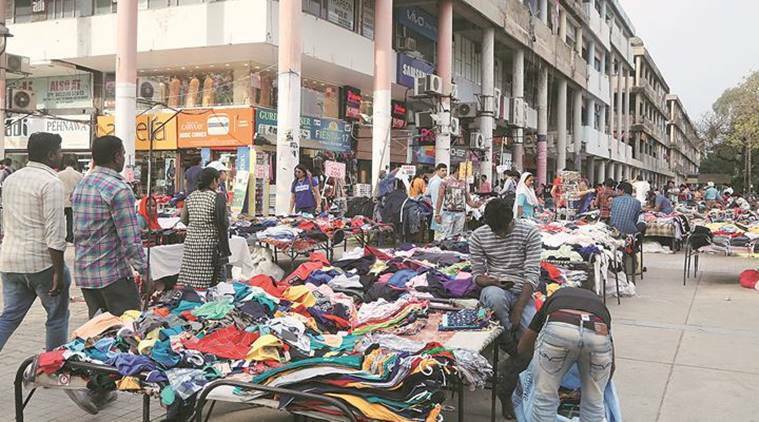 Chandigarh’s creator, Le Corbusier, may not have imagined that Sector 17, designed by him as city’s heart, would turn into a flea market one day. In the last five years, the ‘City Beautiful’ has been usurped by unauthorised street vendors. All of city’s prominent commercial and tourist spaces have been taken over by illegal street vendors in an unprecedented proliferation, leaving no room for pedestrian walkways. The delay by the MC in issuance of street vendors licences under the Street Vendors (Protection of Livelihood and Regulation of Street Vending) Act has resulted in worsening of this situation. The anguish of city’s residents over crowded spaces has simmered through various manifestations- representations, suggestions and objections that have culminated into candle light marches. But all in vain. With elections here, residents of Chandigarh want the new Member of Parliament to prioritise the issue of street vendors in the city. The number of street vendors has swollen ever since a survey was conducted in May 2016, under the Street Vendors (Protection of Livelihood and Regulation of Street Vending) Act. According to the survey, there were 22,214 vendors in Chandigarh who were to get legal status despite the enforcement limiting the number of legal vendors to 7,500 in 2012. However, market welfare associations say that the number is much higher in just two years. The reason being that over these two years, the civic body did not evict or remove any vendor on the grounds that the survey process was ongoing. VK Nirmal, president of Sector 44 RWA, pointed out that encroachment, especially those in front of shops, add to the woes of pedestrians, shoppers and are really horrific for senior citizens. Sushil Malhotra, general secretary of Government Houses Residents’ Welfare Society of Sector 22, said the problem was aggravating as the street vendors had started parking their vehicles ion front of their houses on daily basis, making vehicular movements very difficult. Vinod Vashisht, convener of City Forum of Residents Welfare Organisations (CFORWO), said, “Seeing no respite from continuous proliferation of unauthorised encroachments by illegal street vendors in various residential and commercial areas of city, a 10-point Charter was jointly submitted by all RWAs and MWAs of Sector 22 (being the worst hit) to V P Singh Badnore, Administrator, Chandigarh, on December 17, 2018, under the campaign, ‘Save My City Beautiful’. “Encroachments need a proper solution so that our footpaths can finally breathe. In developed countries like USA, when people suffer economic losses, they sit back at homes and bank upon the social security in the intervening period. In absence of such a mechanism in India, people resort to opening vends and flooding all streets with them thereon. In fact, non-implementation of the Street Vending Act is neither in interest of residents, nor in interest of street vendors. Only small time unscrupulous elements are taking advantage of the situation. There is even a ‘time sharing’ concept under Section 14 of the Street Vendors Act, which can be used to accommodate more street vendors in same vending zone. Additionally, Chandigarh Traffic Police should also start invoking Section 188 under the Motor Vehicles Act, 1988, and Section 336 under IPC on illegal vendors who are found encroaching upon road pavements and endangering lives of the pedestrians,”added Vashisht. It was only in December last year, ahead of the polls that the Street Vendors (Protection of Livelihood and Regulation of Street Vending) MC Bylaws were notified. Draw of lots were held to give the vendors vending zones. As there was hue and cry over the vending zones even after the draw, the process was put on hold citing polls. “As a citizen of Chandigarh, I feel, any project under the ‘Smart City Project’, is sheer wastage of money, unless and until the existing city is made encroachment-free. The otherwise well-planned city by Le Corbusier is ignored by its care-takers. Whether it’s the MC or Chandigarh Administration, both are passing the buck to each other and very little is being done to protect the city’s heritage. The members of Heritage Protection Group have been running from pillar to post to shift the illegal vendors from Sector-22. I still hope that the City Beautiful is once again known for its spacious planning” said Gianender Ahlawat, Chairman of Heritage Protection Group (Chandigarh). The Plaza in Sector 17 witnesses more than 300 vendors, spread across the area in such a way that there is little space to move around. This is despite the fact that Sector 17 has been declared as a no-vending zone by the administration. As a sign of protest, the Joint Action Committee of traders in Sector 17, even held a protest in 2018. They observed a ‘black hour’ by switching off all lights of the plaza. However, the situation still persists. “There is utter chaos at the Plaza. Tourists from across the country and abroad visit Sector 17 only to find street vendors sitting on . Vendors have encroached upon the entire area, leaving little space for visitors to walk,” Raj Kumar, a shopkeeper said. People elbowing their way through narrow lanes and closely situated kiosks perfectly describes the situation in Sector 22. Street vendors have encroached almost every corridor and parking lot in this area. In case a fire breaks out here, there would not be any space for even a fire tender to enter the area.